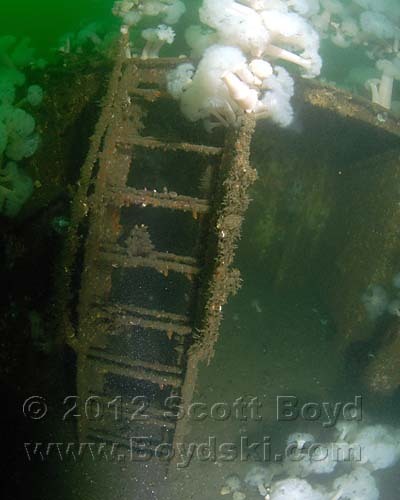 The Coastal Freighter is a 120' Steel Hulled wreck that was located in Tacoma's Commencement Bay. Large anchor chains that are attached to the starboard side as well as the stern indicate that it sank while anchored out in the harbor, likely waiting to be scrapped or used as a breakwater. The raised after deck has a large open cargo hatch that allows divers to drop down through two deck levels to the empty engine room. The engine, shaft, propeller, rudder and all machinery appear to have been removed prior to sinking. There are also two other large, open cargo hatches (and one closed) that allow for easy wreck penetration into the holds of this Tramp Freighter. The raised foredeck is very picturesque, surrounded by elegant handrails and large bitts. 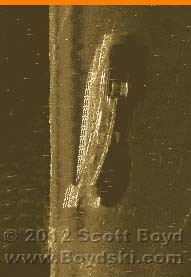 The forepeak is largely empty, with just a few old tires (fenders) but is easily accessed via an open door to port or starboard. There is a lot of commercial and pleasure boat traffic in Commencement Bay, so this dive is much safer to do during the winter when traffic is at a minimum. After periods of heavy rain, the silt flowing out from the Puyallup river can make the visibility at this wreck dive very poor. Portions of the wreck are covered in a layer of fine silt. 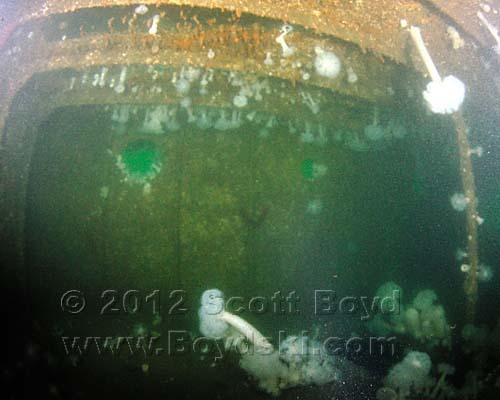 This wreck was first located by Scott Boyd and Jeff Carr on 18 March, 2012. Location: Commencement Bay, Tacoma, Washington. Depth: 100 - 130' Hazards: Low vis, Depth, Boat traffic.